With the opening of LMU‘s new BMC, one of the most ambitious research institutes built in Germany in recent years officially goes into service. The new unit is designed to bridge the divide between basic research and clinical application. LMU‘s HighTechCampus in Grosshadern/Martinsried reached a new milestone in its development today, with the official inauguration of the new Biomedical Center Centrum (BMC). The new Biomedical Center (BMC) is the largest research institution to be built in Germany in recent years, providing laboratories for some 60 research groups and with a staff of 450. In recognition of its nationwide significance, construction of the Center was financed jointly by the Federal and Bavarian governments. The BMC is a central element in LMU’s strategy for the close integration of biomedical research and patient care. In terms of its core mission and its combination of preclinical, research-oriented and clinical departments, it bridges the divide between basic research and clinical application. In this sense, it fits perfectly into the matrix of research units that has grown up here over the years. For the Martinsried-Grosshadern area is already a highly regarded location for research in the life sciences – and the density of renowned institutions sited here is virtually unique in Germany. Moreover, its outstanding infrastructure makes it an ideal environment for first-rate interdisciplinary research. All living systems are based on cells, and all cell functions are controlled by genetic programs. In multicellular organisms, such programs ensure that each cell knows its place and performs the functions appropriate to its location. Although these programs are in large part predetermined by the genomic DNA, they are deployed in a highly flexible and regulated manner: Cells respond to environmental stimuli, metabolic changes, invasive pathogens, tissue injury and other types of stress in specific and coordinated ways. In this context, communication between cells and the environment plays a crucial role. In terms of its research orientation, the BMC is essentially a center for applied cell science. The researchers based in there are especially interested in exploring “the plasticity of cellular programs”. A better understanding of these programs – their development and differentiation, their adaptive potential and their limitations – could lead to the design of new therapeutic strategies. Many serious disorders can be attributed to malfunctions in these programs and their deleterious effects on intercellular communications: Examples include the unrestrained growth of tumor cells and the loss of nerve cells characteristic of neurodegenerative diseases, as well as certain metabolic disorders and autoimmune diseases such as multiple sclerosis and allergies. The BMC brings together departments and institutes devoted to preclinical subjects, as well as research- and patient-oriented aspects of clinical medicine, namely the Chairs of Biochemistry, Molecular Biology, Physiology and Cell Biology, the Institute for Immunology, the Walter Brendel Center for Experimental Medicine and the Institute for Clinical Neuroimmunology. Its research teams will study problems in epigenetics, DNA repair, the dynamics of cell structure and cell differentiation during development, and the establishment and modification of nerve-cell networks. In addition to such basic issues, the BMC will also investigate such clinically relevant topics as neurodegeneration, neurogenesis and neuronal regeneration, the cellular interactions involved in immune responses and various aspects of cardiovascular physiology and the formation of new blood vessels. The BMC also has five core facilities, which are at the disposal of all the Center’s researchers. These units are equipped with the latest instrumentation for bioimaging, bioinformatics, protein analytics, biophysical methods and flow cytometry, and include an up-to-date mouse breeding facility. In addition, the BMC has also been designed to create optimal settings for the implementation of the latest approaches to the teaching of the modern course content in the preclinical phase of medical education. It includes 27 seminar rooms of varying sizes, lavishly equipped laboratories for practical classes and its own library, as well as LMU’s largest lecture theater which seat 950 people. A second auditorium has a seating capacity of 300. At any one time, 120 medical students will receive their basic medical training here, but the Center’s facilities can cater for up to 2000 students. With over 18,000 square meters of floor space, the BMC provides a state-of-the-art environment for basic research and training in the biomedical sciences. 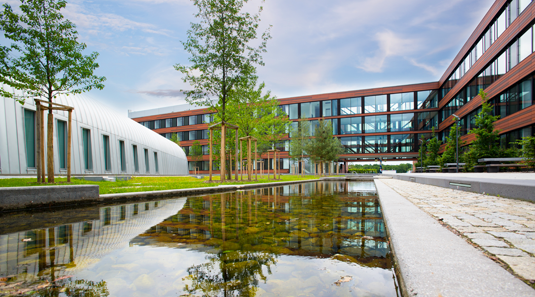 Thus the Center forms an integral element in the first-rate research infrastructure that has been created on the LMU’s HighTechCampus in Grosshadern/Martinsried. The new building is located in the immediate vicinity of the LMU Medical Center in Grosshadern, the Faculties of Chemistry and Pharmacy and the Gene Center, the Faculty of Biology, the Institute for Stroke and Dementia Research and the Max Planck Institutes for Biochemistry and Neurobiology. The construction costs of the Center amounted to some 125 million euros, while a further 23.5 million euros went into furnishing and equipping its laboratories and interior spaces. On the recommendation of the German Science Council, the new Center for Applied Cell Science was classified as a research unit of nationwide significance, and the total cost was shared 50:50 by the Federal Government and the Government of Bavaria – in accordance with Article 91b of the German Constitution. In addition, the State Government contributed the full cost of the Central Unit of the BMC and the building that houses the teaching facilities.